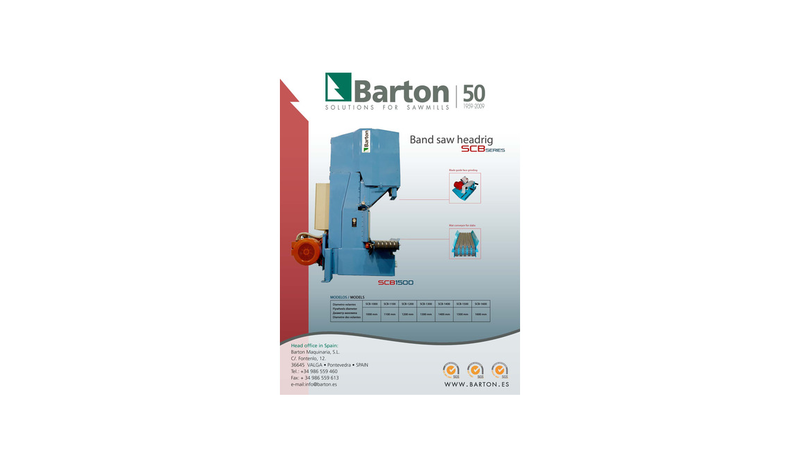 Homepage>Exhibitors & Products >BAND SAW HEADRIG. SCB SERIES. -Heavy-duty steel frame, bearings in cast iron, axles in high resistance steel and flywheels in FG-25 cast iron at dynamic balancing. -Push blade guide in high abrasion resistant material, hydraulically operated to do the up and down movements, which allows a greater stability of the blade and higher cuttings speeds. -Automatic, stable and hydraulic operated blade tension device. -Centralized lubrication of blade and flywheel face by automatic pump. -Single or Double (Optional) cutting system. -The machine is completely enclosed so as to avoid access to dangerous parts. Stops automatically in case of covers opening. -Easy aperture of covers to blade change. -Hydraulic and electric pack incorporated. -All the operations can be remote controlled from the log carriage control switchboard. -Safety requirements in compliance with EC Regulations. -Proximity detector between the log and the blade. -Machine mounted on steel frame or concrete walls.